Sports event programs for all fitness levels and group sizes. 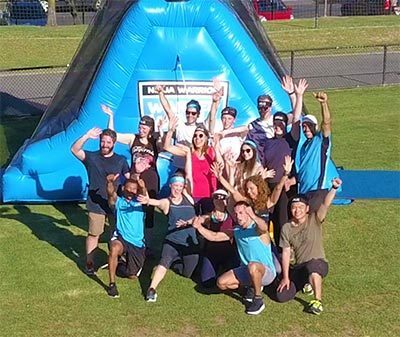 Proactivity works with companies big and small to create the ultimate sports and entertainment experience for corporate events all around Victoria. With many years of experience, we tailor entertainment toward your specific needs and deliver fantastic results every time! We aim to create a fun atmosphere at your special occasion by providing engaging and interactive sports entertainment, and our professional (and super fun!) entertainers will help your event run smoothly and stand out from the crowd. Our entertainment can fit your theme and our friendly team have a wide range of suggestions to make the event your own! A great option when you are expecting a large group and a wide variety of ages; we can designate one or more choices of activity for children to participate in for your desired duration (giant inflatables, fitness obstacle courses, ten pin bowling and basketball shootout are just some of our options!). The ULTIMATE experience for teams! Challenge your team to the mega-fun Ninja Warrior obstacle course - brought straight to you by Proactivity! Mega fun and suited to all ages, group sizes and fitness levels plus you'll be looked after by Proactivity's professional coaches. Please tell us about your event and we'll get back to you ASAP! Last step, let us know of any particular requirements or questions you may have.